What is the Role of an Arborist? | Mr. Tree, Inc.
Should I Remove a Tree Stump? If you keep trees on your property – whether home or business – you probably already know a thing or two about tree care. Each day, you ensure that your tree gets plenty of food, water, sunlight, and other essential needs. You may even have taken it upon yourself to trim the trees a few times. But trees are complicated organisms, prone to a wide variety of problems that differ depending on the species and climate; sooner or later they will require specialized care. Portland, Oregon is home to hundreds of different tree species, each with its own unique requirements for care and maintenance. If you have or are planning to have, trees on your property, you will need to find a good Portland arborist through a local tree service. In the simplest terms, an arborist is a tree surgeon. Arborists are specially trained and licensed to work in every aspect of tree care, from evaluations, to pruning, to the diagnosis and treatment of infections and disease. Arborists are not only responsible for the health of the trees on your property; they also help to ensure the safety of the people who live and work there. They are certified to handle jobs that can be dangerous for untrained people, such as climbing into trees to prune large, and potentially unstable, branches. Do I really need an arborist? Can’t I just care for my tree myself? An arborist has many responsibilities that relate to every aspect of tree care. They are specially trained to identify problems a layperson might not notice. They are also trained to handle these problems safely, without harming the tree, your property, or themselves. One of the most important tasks that should always be left to a professional is the pruning of large branches. Big, heavy branches can become sick and weakened and pose a risk to the people and property below them. If they are at risk of falling, they must usually be removed. Removing a large branch, however, isn’t easy. It requires someone trained to safely climb into a tree – without causing any damage to the trunk and healthy branches – and to cut the limb safely. Then the limb must be guided down to the ground safely to avoid causing any damage on the way down. Because such a task requires both special training and special equipment, not to mention insurance, you should always leave it to a professional. 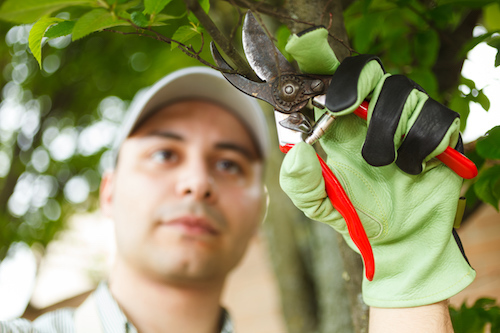 Portland arborists will bring hard hats, ropes, and all the proper cutting tools to get the job done safely. I think my tree is sick; can an arborist help? One of the tasks that arborists are trained for is to evaluate and treat tree diseases. Even if the tree seems fine, it’s a good idea to have it occasionally inspected by a professional. Just as you should regularly take your car to the shop to ensure it’s in good working order, and visit the doctor and dentist to keep your own health at its peak, you should schedule periodic check-ups for your tree. An arborist will inspect the bark, leaves, and branches of the tree and check for signs of injury, malnutrition, pest infestation, and any of the other common problems that plague Portland trees. They’ll check the bark to ensure it’s not unusually soft, which could be a sign of a termite infestation. They’ll look under the leaves for signs of black dots, which could indicate the presence of a fungus that prevents nutrients from reaching the leaves. If they notice any signs of infestation or infection, they can take the necessary steps to treat the issue. Sometimes this means pruning the affected areas; other times it means making use of a natural insecticide that is harmless to the tree and beneficial insects, as well as birds and other animals. I need to remove a tree; can an arborist help with that? Sometimes, if a tree is sick and cannot be saved, or if a tree has become too heavily damaged by inclement weather or other conditions, you will need to remove the tree from the property. Removing a tree – fully removing it, stump and all – is a difficult and extremely time consuming process. First, the tree will have to be cut down, and its fall guided safely to prevent harm to any nearby property. The tree will then have to be disposed of properly, with safety being ensured the whole time. After all this has been done, the stump itself will need to be removed, which is another task an arborist can undertake. Sometimes they will use a truck and cables to simply wrench the stump out of the ground, but other times, a more delicate approach must be taken. The arborist can make use of chemicals to rot the stump until it is soft and can easily be pulled away, or they can burn the stump away by allowing it to smolder until it can be easily taken apart and removed. Another area that arborists specialize in is the planting of new trees. Whether you have just had a tree removed and want to replace it, or you are looking to plant for the first time, an arborist can help make it happen. The climate of Portland is ideal for a huge variety of tree species, some native, and some not. An arborist can make recommendations as to what specific types of tree can thrive on your property. Different species of tree do better depending on the conditions; some prefer a more acidic soil, while others need partial shade. Once you have selected a tree you like, a trained arborist can plant it for you and help you care for it during its vulnerable early months. So whether you need to care for an existing tree, or want to plant a new one, contact your local Portland arborist today!